(finally!) and a variety of winter ducks. A few waterfowl on the move at Derby Hill today on 15-20 MPH west winds. about without new birds coming in. South winds gusting to 20+ knots and some high clouds. Bald Eagle numbers were nice but there were few juvenile Broad-wings today. have a heavily streaked body and a tawny bar on the upper-wing coverts. including Common Nighthawk, Olive-sided Flycatcher, and even a handful of warbler species. count ever, besting the previous month record of 18,279 from 1982.
about 2:15, and the birds started coming through by the thousands! (33) and Bald Eagle (39). set up on tables and in tents atop the Hill. in the last month of counting in 2012 instead of the middle one. four species are likely wholly weather induced. anything you’ve seen on this blog at krw at derbyhill dot org. time since 1985 the count has topped 24,000 individuals. the previous record flight, also from 2009, by 60 individuals. year: 543 thus far in 2012 relative to a historical average of 427.
digits worth of Ospreys have been tallied. the natural world and some of the organisms we share this planet with. are, and I offer my sincerest thanks for your efforts! different vibe and collection of flora and fauna to awe and amaze. of working for NPR in a future life). than 2012 has been. It’s been fun, aloha and mahalo! on days with south winds as northbound migration continues into July. winds from August into November (and further?). piled on. Sky was clear blue by noon EST. Yellow-billed Cuckoo called several times over the last hour. Warm with southwest wind early, thunderstorms in the afternoon. daily high for the year. 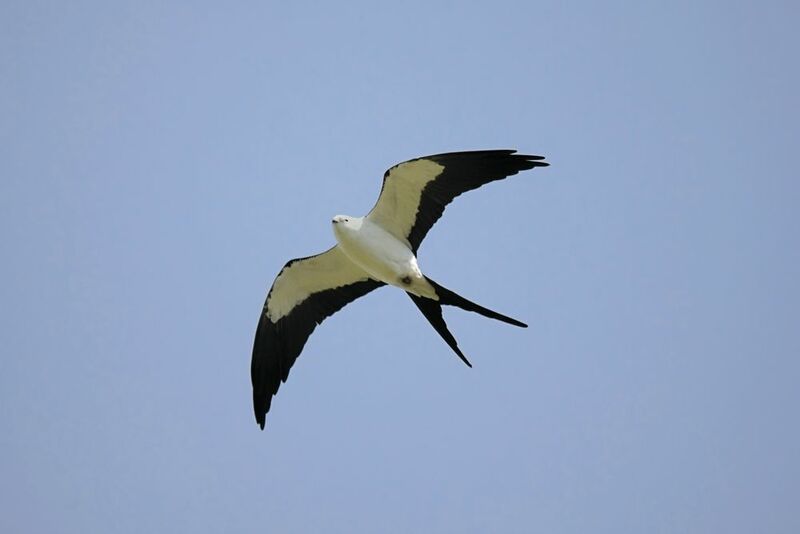 On May 5th 2012 when Bill Purcell yelled “Swallow-tailed Kite”, I looked up from the south lookout parking lot to experience a Derby Hill Déjà vu moment. As this kite lofted at the top of a Broad-winged Hawk boil my mind flashed back thirty six years to the first of its species that graced Derby Hill on 16 April 1976. In 1976 16 April was Good Friday and the day began with a heavy fog blanketing the north lookout. In those days there was no daily hawk count and many days lacked any observer coverage. On the 16th gradually a few observers arrived including Dave and Janet Muir and Bill and Larry Holland. Thick fog is unusual along Lake Ontario in spring and it seemed reluctant to lift. Glenn and Betty Perrigo from Rochester arrived then departed for a cup of coffee. As we waited patiently, patience being a great Derby Hill virtue, hoping for an early Broad-winged flight, the fog began to stir with a stiffening but still light southerly wind. A couple of Sharp-shinned Hawk appeared low through the haze giving hope of a flight. In those dark days of the DDT era, with unnaturally low raptor populations, any migration was a treat. All present were hoping for an eagle, any eagle, as one-two eagles in a day made a successful Derby visit. Little did we suspect the rarity of the day would be far more unusual than any eagle. Soon after the haze had lifted and the wood line to the west became visible a couple more hawks appeared. I remember looking at the first Broad-wing of the day when I heard Bill Holland, age 16 at that point, utter” What kind of swallow is this?”. Bill was a good young birder who undoubtedly knew it was not a swallow but was reluctant, with 4 adult birders present, to identify the bird. As I swung my binoculars to the southwest they filled with the image of a Swallow-tailed Kite coming directly at us slightly above eye level gradually gaining altitude. Outside of screaming SWALLOW-TAILED KITE I do not recall what else was said and probably from the standpoint of decorum that is a good thing. The bird lofted and moved slowly to the east over a period of four to five minutes giving us all great looks. It is interesting to note that the 2012 bird also was in view for several minutes. Even though only 2 individuals of this species have passed over DHBO a total of 10-15 minutes of observation time has been possible. The Perrigos missed the bird by three minutes making their coffee extremely costly. For the rest of us Derby’s first Swallow-tailed Kite is a great birding memory. Of the five observers present on 16 April 1976 Larry Holland is no longer with us, but I am sure the other four all remember that first bird fondly. My only current concern is the realization, that if the time interval between Swallow-tailed Kites at DHBO remains 36 years/3 weeks, it may be a real challenge for me to be present for the next one! few raptors are moving on anything other than south winds. become the usual 30 or so Bald Eagles in late May on good winds. Warbler. Small numbers of Redstarts and Blackpolls flying over. Good SSE winds through the day and nice clouds for background. to Gerry Smith for covering the last half hour. Clear blue skies and north wind building to 8 MPH. have missed a lot of birds. temperature dropped. Few clouds for the first 4 hours today. Moderate NW winds and clear blue sky. the morning giving way to a lake breeze. continue to push them up to the lakeshore if not out over the lake. Light south winds gave way to a lake breeze at 12:30 EST. north lookout. Black-billed Cuckoo called several times. most of the count period. b-dubs seemed more important than eagles in my mind today. the walk ultimately producing 72 species of passerine and near passerine. seen migrating north from the south lookout. the window writing this at about seven bird time on Sunday morning…. weren’t too high) and temperatures ranging from nine to thirteen c.
other flight feathers? A mystery wrapped in an enigma for sure! southwest shifting to west northwest by count’s end. Lake Ontario Shore, it makes me wonder if one is trying to hold territory. Habitat ain’t quite ideal, but, still makes me wonder. day’s count of 1330 Blue Jays. Rose-breasted Grosbeaks and White-crowned Sparrows were the most glamorous of the twenty or twenty-five ish species at the feeders, but it was so wet, I did not get around to doing much birding other than looking out the windows today…. West winds, chance of rain/t-storms in the p.m. … not the best for a great flight, but, likely a touch bit better than today? southwest starting around two fifteen. down in Sage Creek Marsh at the foot of the Hill. neglected? or just to catch up on the sleep? hmmm…. shaft (yes, it was close enough and slow enough to count the primaries). head it was with a dark throat and a grey, almost white nape. My opinion? criteria, if one is of the ilk that Arctic is a separate species anyways). Partly cloudy skies with north northeast shifting to north northwest winds, gusting above 15mph, temps around 12 or 13 c.
birds he/she/they counted even statistically significant? Low cloud ceiling most of the day, though the sun did start to break through around 15:30 bird time. Temperatures ranging from twelve to nineteen Celsius with winds mostly from the west northwest. May 1982, however, May 2012 still has 27 days to go. Kinda crazy. write this at about eleven in the p.m.
falling out early in the a.m.? between two-thirty and three and 6827 between three and four. the day and through the flight, hopefully without too much being missed??? To all my squirrelfriends who so enjoy vicariously birding Derby Hill through the magic of email, oneidabirds, and the Onondaga Audubon Society website (OnondagaAudubon.com), I again lack the time and energy to enter all the hourly bird and weather data necessary to generate the hawkcount dot org reports, but suffice to say Wednesday’s flight, while not an epic mega flight by any stretch of the imagination, was one of the best to date for the season, with high counts for the season (thus far) for Sharp-shinned Hawk (664), Osprey (137), Bald Eagle (39) and Broad-winged Hawk (2471). The Osprey flight in particular, while nowhere near the 1990 record flight of 201 birds, is the tenth highest single day Osprey flight in Derby Hill history, and only the twelfth single day to see three digits worth of Ospreys. Also of note on Wednesday was the season’s second Swainson’s Hawk, interestingly just like 2011 exactly thirty days/one month after the season’s first. The bird appeared to be a lighter side of dark-ish/darker side of intermediate/rufus-ish 2011 hatched individual. It is also worth mentioning that while only fourteen species were officially documented by the site’s official counter, there were reputable reports of 16 species of raptor migrating past Derby Hill today. Blue-winged and a first of season for the site Northern Waterthrush. amazing numbers, maybe five or six hundred over the course of the day. only a few Bank and Cliff mixed in. Hummingbirds were seen at the feeder. pair were anything other than Harlequins. see a few of you on the Hill! Light south southeast winds, becoming variable around ten thirty as a lake breeze tried to kick in, and going to pure north northwest by noon thirty. Temperatures from eight to twelve celsius, with high stratus clouds covering seventy-five to one hundred percent of the sky. from six to nine celsius…. across the grey whispies…” and so on. well south of us across a broad fronted flight line. Friday, April 27 – No count conducted today. but mostly unseasonably chilly northwest winds…. did not inspire a push of birds all the way up from the Ohio River Valley. counting, we would have had over 3,000 b-dubs today???? gusting above fifteen mph, with temperatures ranging from two to six celsius. Also, bands of rain, drizzle, sleet and hail moving through the area much of the day. and only one bird was counted in that period. think this was not an absurdly late date. to cooler than normal temperatures do not exactly encourage a big flight. the best of days for a first time visitor. northeast, gusting above twenty mph, while upper level winds were bringing in moisture from the southeast. The only check of the thermometer that I made all day (at about eleven) found the mercury creeping up to the one degree mark (on the celsius side of course). Derby Hill today. (But the day is still young?) A new influx of White-throated Sparrows was quite obvious, and while warbler diversity was limited to just two species, one of those two was a first of season for Derby (if not the county and the region) Northern Parula, singing his little heart out in the cold and driving rain. But all in all, an unrewarding couple of hours spent walking the hedgerows in the rainsuit. Field trips scheduled weeks and months in advance always pick the best days to come on! as were four species of Swallows. regardless of wherevers you are. like to be referred to as peons… this may be a more p.c. term? Variably but mostly cloudy skies, with temperatures from eight to twenty celsius. A light surface level south southeast breeze in the morning giving way to a north northwest lake breeze starting around eleven thirty bird time. Cloud motion, however, would indicate that upper level winds were out of the west southwest for the entirety of the day. the morning, but mostly clearing by about noon thirty bird time. optimism, I do think we have a decent shot at four digit counts both days. start and end, but a few hours mid day with mostly painfully blue skies, and oh, by the way, the mercury in the thermometer made it up to the thirty degree hash. one fifty to four hundred is more reasonable? cloudy and a brief bit of rain at about three bird time. Temperatures at count’s start were about six celsius, but worked their way up to a high of fourteen. or the count would have been half what it was. replaced about 1/3 to 1/2 of the secondaries already). expected/hoped for given the date and Friday night’s weather. position atop the north lookout… thanks team! that report.. mentally fried counter, sorry? but, as regular readers are well aware, I’ve been wrong before. the frustrated counter… you know it’s a slow day on the lookout when… all that I can say is that I feel so normal next to so many of our volunteers and “regulars” on the Hill… thanks gang! Mostly clear skies with winds from the north northwest and temperatures hovering between six and eight celsius. Another light flight but with decent diversity. Some high birds, some birds appearing right overhead in the blue, which likely translates to a higher than usual portion of missed birds too. can wait for more ideal (and more energy efficient) weather to move in. the same books I do. Friday and Saturday could both be good, though for different reasons. drizzle, there is the potential for a push migrants ahead of the precip. than any given day over the last week if the forecasts hold. Still on the backside of a decent sized low with mostly cloudy skies and a few brief spells of light drizzle. Winds out of the north northwest shifting to west with temperatures from five to eight celsius. early, especially given the lack of general movement over the last week). (1) Hermit Thrush, which undoubtedly do not overwinter too far from the site, and I have been quite surprised not to have seen or heard them prior to today. (2) Blue-headed Vireo, which had me doing a double take (fortunately the bird sang and called multiple times, though I never saw it). Unlike the thrush, this strikes me as quite early. Full report for the day should hit your inboxes sometime in the next 36 hours, but with only 25 raptors counted as migrants, trust me, what’s written above are the highlights of the day. Overcast with west and northwest winds gusting to about thirty mph. Temperatures from five to eight celsius. Light drizzle starting around eleven-fifty, and continuing off and on for the rest of the afternoon. temperatures around three celsius for most of the count, but warming up in the last two hours of the count and making it to a balmy seven by count’s end. other ten from the south. A weak occuluded/cold-ish front on the doorstep to the west, but with mostly sunny to partly cloudy skies over Derb today, and surface level winds out of the northwest shifting to north northeast shifting to north northwest shifting to nearly due west by count’s end. year’s model seen thus far this season. have been of more than one individual). 45 minutes in my 18 years of birding. looks on the weather maps to the ornithologists? the count, but mellowing to ten to fifteen mph and shifting to northwest and then nearly due west origins for the last two hours. afterwards having dropped to about four celsius. Also a brief (less than ten minute) spell of hail at about noon. patagial marks and extremely reduced commas on the outer underwing coverts. great plains bird, not just a leucistic eastern individual. and about a dozen migrating Great Blue Herons. long as we’re not Went with the Wind). High pressure, with clear skies at count’s start but stratus clouds moving in mid morning, becoming mostly cloudy by eleven bird time and remaining so the rest of the day. Light northwest winds, with temperatures around two celsius at count’s start and working their way up to about six. in the last two and a half hours of the count. northwest midday and finally westerly origins for the last hour and a half of the count. winds and after only a single day of rain to (proverbially) back birds up. -Another adult dark Red-tail at 11:54 (bird time of course). with noticeable dark barring above the subterminal band on the tail. North winds… headwind for migrating north… will keep birds away from the lake shore… yeay!!! A wonky acting weak low sliding from west to east, and mostly to Derby Hill’s south. Winds out of the east southeast and east in the morning, shifting to northerly origins around one-thirty bird time. Overcast all day, with temperatures around freezing at count’s start, reaching a high of about six Celsius early afternoon. their way up to five celsius before falling back to two by count’s end. Winds from the north and northwest, gusting to about fifteen mph. Light drizzle off and on with winds from the north gusting to near 20mph. exhaust the supply yesterday, or should we just blame the weather??? for the last hour or so of the count. juvenile type feathers (and seven went unaged). I’m not going to make a more specific prediction than that! Continued high pressure and cloudless to partly cloudy skies with winds out of the north averaging six to ten mph but gusting above fifteen. Temperatures started off at about three below zero, celsius, but warmed up to about two above for the early afternoon. I’m still as sane as I am! sweetheart to get home to if they’re moving in this kind of weather”. body already adjusted to May-like weather. retained juvenile middle rectricies, somewhere around R3-R5 on both sides. of this strange and amazing day. message… another colloquialism of days past, but I digress…). Some light rain in the morning, pushing east/southeast by count’s start. staying strangely steady around seven (celsius). the southern Lake Ontario shoreline. southeasterly origins by count’s end. low (where it should be in this counter’s opinion). normal eastbound Icterid flight, in my estimate, not topping 2,000 birds). day went on. A few brief moments of drizzle falling from mostly cloudy skies, with temperatures between eleven and eighteen celsius. count for March for the species at Derby Hill was 4 birds in 2004.
just a slow day all around. blue skies in the morning, with some cumulous clouds forming and a lake breeze from the north northwest kicking in for the afternoon. the 30+ years of standardized counting. birds were flying well south of rout 104b (in addition to right overhead). consecutive days of wonderful weather is: are there birds in the pipeline? fission version, or have I been in the sun too long? southeast for the count period, with temperatures from 8 to 10c. wise flying except a local Bald Eagle after eleven bird time. Bad day to be a hawkwatcher, but fun day to be a birder on the Hill. started to break up around two bird time, with a virtually clear sky by count’s end. Early morning temperatures around seven celsius, working their way up to about eighteen in the afternoon, but dropping an astonishing seven degrees in less than an hour when the lake breeze kicked in. should have, or rather did have to count today’s sightings as two birds. well, right? Ah hawkwatching… an art or a science??? gusting midday above 15mph. Temperatures between 6 and 11 celsius. 100% overcast and other times almost 100% clear (painfully) blue skies. to the south/too backlit to be sure. three days this early in the season. high high temperature of 19c. missed… if only that south wind forecast yesterday had held… sigh. therefore presumably hatched in 2011. Canvasback out on the lake, and 9 other species of ducks and geese noted. clear out to the east, and high pressure begins to work in from the south. with winds shifting to west southwesterly origins after about 2:30.
clouds, snow, and sub freezing temperatures not really helping. fifteen and becoming heavier by noon thirty. little push of birds at 11:30ish just as the snow started. really, but at least 4 males singing and displaying behind me this morning. Ummm… Is an accurate prediction really a part of my job description?? ?